2 [looking away from all that will distract us and] focusing our eyes on Jesus, who is the Author and Perfecter of faith [the first incentive for our belief and the One who brings our faith to maturity], who for the joy [of accomplishing the goal] set before Him endured the cross, disregarding the shame, and sat down at the right hand of the throne of God [revealing His deity, His authority, and the completion of His work]. 3 Just consider and meditate on Him who endured from sinners such bitter hostility against Himself [consider it all in comparison with your trials], so that you will not grow weary and lose heart. In thinking on this passage, my mind recalls a backpacking experience that occurred at TFI (Total Fitness Institute) in California back in December, 1975. During this outdoor wilderness adventure I was assigned to a platoon of believers, and we portioned out our food supply for the week among the group. I volunteered to carry the food for the last day, which meant that my load stayed the same while the load that everyone else carried got lighter. In reflecting upon that unforgettable experience, two musical compositions come to mind. First of all, “The Burden Bearer” includes lyrics from an old gospel song that I recall my childhood, back in the day, recorded here by “Pops” Staples and the Staple Singers. We do this by keeping our eyes on Jesus, the champion who initiates and perfects our faith. Because of the joy awaiting him, he endured the cross, disregarding its shame. Now he is seated in the place of honor beside God’s throne. Therefore, since we are surrounded by such a huge crowd of witnesses to the life of faith, let us strip off every weight that slows us down, especially the sin that so easily trips us up. And let us run with endurance the race God has set before us. 2 We do this by keeping our eyes on Jesus, the champion who initiates and perfects our faith. Because of the joy awaiting him, he endured the cross, disregarding its shame. Now he is seated in the place of honor beside God’s throne. 3 Think of all the hostility he endured from sinful people; then you won’t become weary and give up. In thinking on this particular passage, my mind recalls a backpacking experience that occurred at TFI (Total Fitness Institute) in California back in December, 1975. During this outdoor wilderness adventure I was assigned to a platoon of believers, and we portioned out our food supply for the week among the group. I volunteered to carry the food for the last day, which meant that my load stayed the same while the load that everyone else carried got lighter. My experience at the Total Fitness Institute also inspired “The Burden Bearer.” The epigraph or short intro to the poem as well as the closing stanza are lyrics from an old gospel song that I recall my childhood days, recorded here by Pops Staples and the Staple Singers. Call unto me and I will answer you and show you great and mighty things that you do not know. That flows from the wisdom that descends from above. But we choose to pursue God and do whatever it takes. For each life mirrors a lifetime of choices that one makes. We do not shun the Lord’s reproof but embrace correction. The riches of His heritage and greatness of His power. We press toward the mark, to reach ultimate perfection. As we seek intimacy of the highest degree. Open our Eyes/Turn Your Eyes upon Jesus/Open My Eyes, that I May See. Not only is our prayer to God like those expressed in Psalm 119:18 and Jeremiah 33:3: that God will enlighten and illuminate our lives, but we also recognize that God’s prayer for us is the same: that by means of the spirit of wisdom and revelation, that the eyes of our heart may be flooded with light, as is expressed so powerfully in Ephesians 1.This is our prayer today and every day. 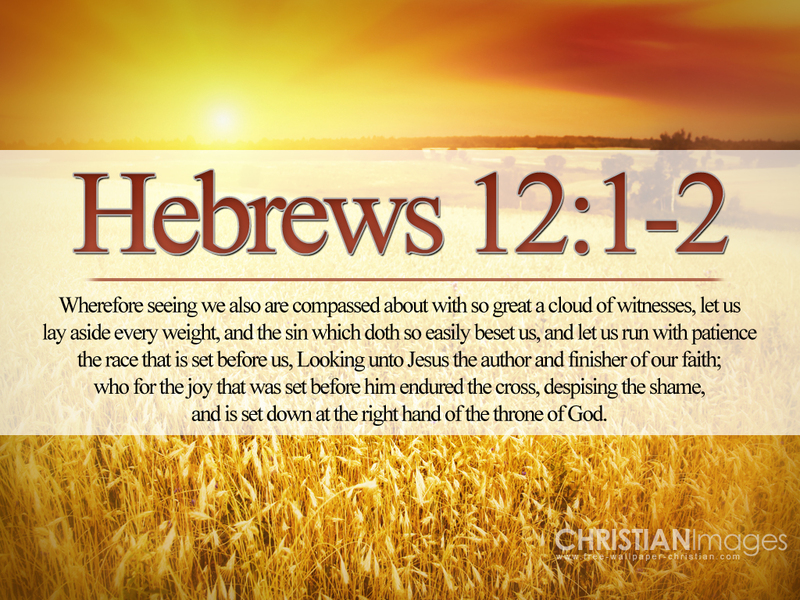 Verse of the Day for July 27, 2015 comes from the Hebrews 12:1 in the Authorized (King James) Version. Wherefore seeing we also are compassed about with so great a cloud of witnesses, let us lay aside every weight, and the sin which doth so easily beset us, and let us run with patience the race that is set before us, 2 looking unto Jesus the author and finisher of our faith; who for the joy that was set before him endured the cross, despising the shame, and is set down at the right hand of the throne of God. 3 For consider him that endured such contradiction of sinners against himself, lest ye be wearied and faint in your minds. My experience at the Total Fitness Institute also inspired “The Burden Bearer.” The epigraph or short intro to the poem as well as the closing stanza are lyrics from an old gospel song that I recall my childhood days, recorded here by the Staple Singers.